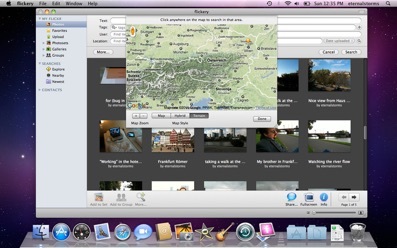 flickery lets you manage your flickr photostream, albums, groups, galleries, favorites and contacts with the ease of use of OS X and the comfort of drag and drop. flickery provides a focused drag’n’drop interface to make uploading and categorizing photos and videos as easy and fast as possible. Adding items to albums, galleries, groups or favorites has never been so easy. 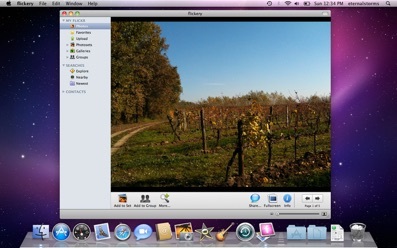 flickery excels at displaying videos and photos. It offers three basic ways: The browser, the windowed- and the fullscreen mode; each finely tuned to give you the optimal viewing experience. If you’re looking for a particular photo on flickr, flickery makes it very easy. Search by text, users and even locations of shots with just a few mouse clicks. Experience flickr like you’ve never done before. Browse your contacts’ shots, the great videos and photos in “Explore” or view some shots taken around your current location - flickery lets you do it all. 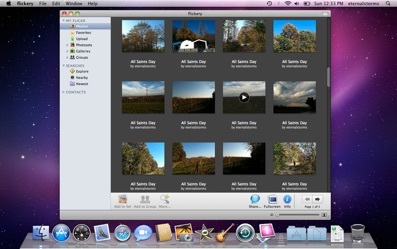 very advanced flickr client for Mac. A perfect solution for anyone using flickr. A must for any serious flickr user. A reason to date Flickr again. 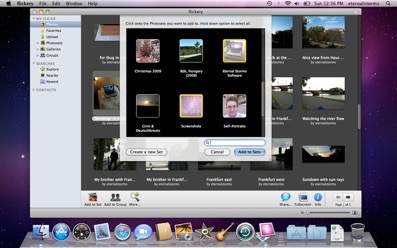 flickery is a Mac desktop client which pretty much does it all. Flickery is a faster, cleaner and arguably all-around better experience than Flickr. If you love Flickr and have a Mac, flickery will become your new favorite app.